Doum palm | Infonet Biovision Home. 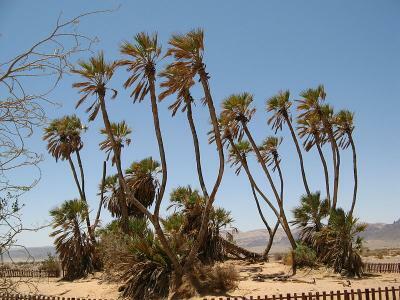 Boni (Medi); Chonyi (Mkoma); Digo (Mkoma lume); English (Doum palm); Gabra (Meetti); Giriama (Mlala); Kamba (Mukoma); Kambe (Mkoma); Mbeere (Irara); Orma (Kone); Pokomo (Mkoma); Pokot (Tangayiween); Rendile (Baar); Samburu (Iparwa); Sanya (Auwaki); Somali (Baar); Swahili (Mkoma, Mlala); Taveta (Irara); Tharaka (Muruguyu); Turkana (Eeng'ol). Widespread in lowland arid Africa, Madagascar and the Arabian peninsula to India. 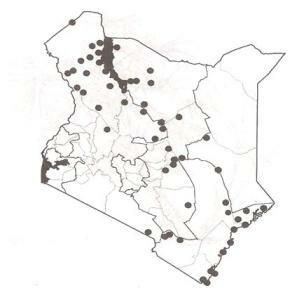 In Kenya is widely distributed in hot areas. Common in dry northern areas along river courses and lakes (Turkana) also very common at the coast. The fruit is a heavily depended on commodity as a source of food by the Turkana in times of food shortage. It is an important source of thatch and handicraft material for the Pokomo and Turkana people. Fruits are eaten by elephants, baboons and the endangered monkey - Tane River Crested Mangbey. It requires a high water table and a hot dry climate for good growth. Altitude is between 0 and 1000 m. Agro-ecological zones II - VII (riverine) and fruit available most of the year. Direct sowing at site, either into carefully prepared pits or any other places where water collects naturally. Not suitable for nurseries since a long "taproot" grows down to 50 - 100 cm before leaves appear. The "root" will carry the embryo down into the ground. Suckers can also be used. Slow growing. Thinning to reduce density; prune long spiny leaves for use as weaving material. Fuel: is a source of firewood. Timber: it can be used in making cabinets bee hives and a good source of poles and posts. Food: it produces edible fruit (pulp, kernel), palm wine from the stem, and juice from young fruit. Other products; fishing rafts, carpets, brooms, hammocks, buttons, beads ("vegetable ivory"). Shade; provides shade in hot sun. Dead fencing; spiny leaf stalks are used in fencing.